The Sri Kaliswari Trust was formed by Sri Kaliswari Group of Companies which is a leader in India’s Fireworks, Safety Matches, Pyrotechnics and Metal Power Industries. The Philanthropists of Sri Kaliswari Group of Companies with the wisdom acquired over 80 years of experience established a leading Stand Alone B-School in the name of“Sri Kaliswari Institute of Management and Technology” (SKIMT), Sivakasi in the year 2012. The Institute offers a full time MBA Programme approved by AICTE, New Delhi and affiliated to Madurai Kamaraj University, Madurai. SKIMT is located in a vast campus at Anaikuttam, on Sivakasi – Virudhunagar Main road. SKIMT offers a Value Based Quality Management Education to the students with degree in arts, science, engineering, agriculture and vetenary science particularly to the students belonging to the south Tamilnadu. SKIMT focuses individuals to realise their inner potential and provides a global approach to their thinking and actions. The Institution offers functional specialization in the areas of Marketing, Finance and Human Resources to gain sharper insights and broader perspectives in different areas of the interest of the learner. The state of art facilities creates a conducive environment for the teaching-learning process. Brain storming sessions, Seminars, Workshops, regular Industrial Visits and Guest lectures by eminent personalities and experts provide a blend of learning, training and practical exposure to enhance competencies to executive positions. 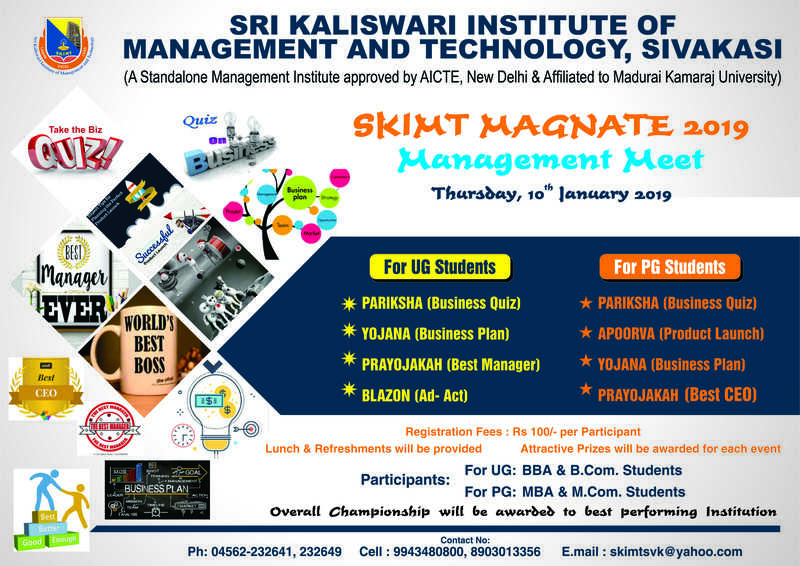 The students in SKIMT are encouraged to actively participate in the various activities conducted by the clubs such as Investors Forum, Marketing Club, Association of Innovative Managers Club, Readers Forum and Women Entrepreneurship Development Cell. The bi-annual journal “Business Plus” with the ISSN Number 0975-9336 is being published by the Institute which serves as a platform for publishing research and conceptual articles written by students, research scholars, academicians and industrialists. In addition, the Institute offers a one year full time M.Phil. programme in Management, affiliated to Madurai Kamaraj University.The M.Phil. Course enables the students to pursue research in their chosen areas of Management. The Learning Resource Centre of SKIMT is equipped with 2,622 books, 6 International Journals, 27 National Journals and Magazines, Delnet and N-list. The Computer Lab functions with 24 hours High Speed Lease Line Internet Accessibility with Wi-Fi connectivity. Students are provided with individual Laptops.